We met with Haydar Özkömürcü in a training program in 2013. She was coming to our lesson titled "Social Media Commissions". With so many social media channels from Turkey and the world, and I have information about advertising services. These advertisements and advertisement services I have learned are still working for the projects we have carried out for the brands we serve. Heydar Özkömürc who have served more than two hundred brands in the field of Digital Marketing, marketing education in Turkey's leading institutions and universities. Haydar Özkömürcü's Being Google and Being Twitter There are two books named. 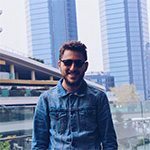 Project Manager at Promoqube, Marketing Manager at Hospitadent, as well as founding partner of Marketing Meetup and Growsta, former managing partner of Pazarlama.